NES Zelda II: The Adventure of Link (USA) in 38:38.45 by Arc & Inzult. 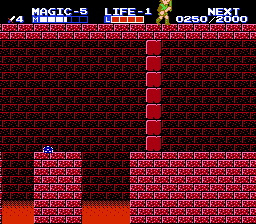 Zelda II: The Adventure of Link is quite different from most of the early games in the Legend of Zelda series. It combines an overworld view with side-scrolling platform stages. In addition, the character can gain experience and levels, visit towns, and earn spells and items which are needed to proceed. This movie is a new branch that allows warps but not the scroll-lock glitch, used in the other run we have published. A "warp" (or "wrong warp") in Zelda II is when an exit takes Link somewhere other than where that exit is supposed exit into. Read the authors' comments for details. For a "warpless" run, see  NES Zelda II: The Adventure of Link (USA) "warpless" by Arc, FatRatKnight, Inzult & Rising Tempest in 45:26.04. This movie was a part of a two-hour Zelda II TAS showcase with audio commentary by Arc, Inzult, Jackimus, Mithical9, and Feasel.